Obock, Djibouti (CNN) They trudge, exhausted, along the desolate winding road to Obock in northern Djibouti, flanked on either side by a black, alien landscape created millennia ago by volcanic eruptions. "Ethiopia is broken," one of the young men says of his homeland. He is traveling in a group of four from Jimma, in southwest Ethiopia, each carrying nothing but a bottle of water. In the distance, the Bab al-Mandeb Strait, which separates the Horn of Africa from the Arabian Peninsula, glimmers in shades of dark blue, turquoise, and green. "Yemen," the man says, citing his next destination. "From Yemen I can go to Saudi Arabia for work and send money to my mother." About 20,000 migrants, mostly from Ethiopia, attempt the journey along this ancient and increasingly deadly route through Yemen's war zone each month, according to the International Organization for Migration (IOM). They all risk deportation if they come to the attention of the police. Many are unaware of the war in Yemen, the bombs, bullets, mortars, and mines. They are unaware of the dangers of the crossing, and the bodies that wash up on Djibouti and Yemen's shores. Obock is a small fishing village on the northern shores of the Gulf of Tadjoura. It is also the center of a confluence of despair. On the same sliver of shoreline where Ethiopian migrants depart for Yemen and what they hope will be a better life in Saudi Arabia, Yemeni refugees -- some fleeing Saudi-led attacks -- are arriving, haunted by memories of the nightmare they have just escaped. 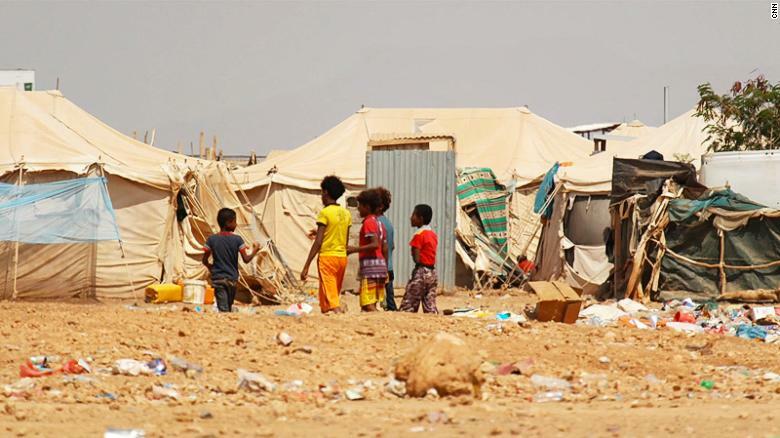 For many Yemenis, the hot, dusty and windswept Markazi Refugee Camp is their first stop. The Markazi Refugee Camp in Djibouti. Several rows of generator-powered white containers today have all but replaced the less sturdy United Nations High Commissioner for Refugees tents at this camp, which 1,300 or so Yemenis currently call home. The containers were a gift from the Saudi government -- an irony not lost on the refugees here. It was airstrikes from the Saudi-led coalition that forced Naghuib, his wife, and two children -- 6-year-old Rasha and 8-year-old Mohammed -- to flee. In Yemen, Naghuib's family lived near Khokha, a small village on the shores of the Red Sea. Over the past four years, Naghuib says 25 people from his rebel-held village have been killed, including neighbors and relatives. Intense fighting between the Saudi-led coalition and Iranian-backed Houthi fighters has gripped the country since war broke out in early 2015. Naghuib says homes, schools, and mosques in his village have been destroyed. As the situation worsened, sometimes his family could not find food, he adds. When there was a lull in the fighting, he and his family decided to make a run for it. Naghuib, and others interviewed for this story, only wanted their first names used because of the sensitivity of their situations. 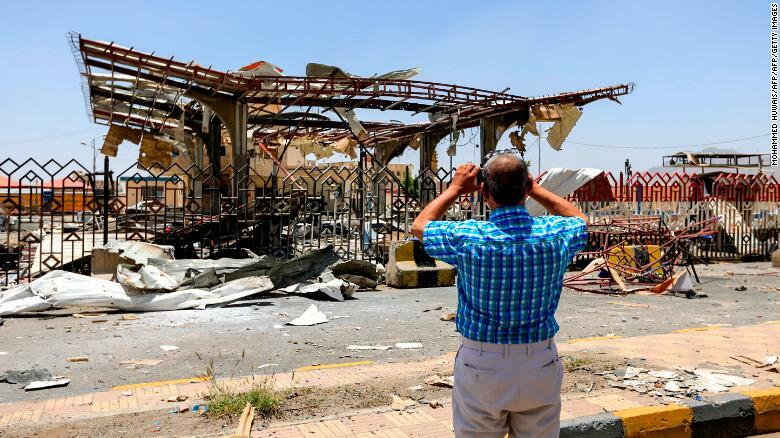 A Yemeni man takes a picture of a destroyed petrol station that was hit by an airstrike in Yemen's capital Sanaa on May 27, 2018. "We came in a small fishing boat," he says. "We were lucky the water was smooth. It took us three hours." Nearly 40,000 Yemenis have fled to Djibouti since 2015, according to UNHCR. While the Djiboutian government has been praised for recent reforms, including granting refugees permission to work inside the country, the vast majority of Yemenis that arrived here have moved on to other countries. Many Yemeni refugees have relatives in the United States, and according to UNHCR nearly 15,000 have moved from Djibouti to the US since the conflict began. "We came for their future," Naghuib adds, pointing to his children. "We'll go anywhere they take us." Naghuib remembers encountering migrants from Ethiopia who were walking through Yemen. "We would say, 'Where are you going? There is a war.' Most of them didn't speak Arabic. We say, 'Don't go.' They say, 'God is with us,'" he adds. Another Yemeni refugee, Abdulrahman, who has just arrived at the camp, says he had similar encounters with migrants back home. "Their only thought is to get to Saudi," he says. "We try to tell them there are mines on the road. They don't know what it's like." Abdulrahman knows the dangers only too well. He says he lost his wife and daughter to a mortar bomb around eight months ago. The day after he arrived in Djibouti, he found out that his eldest son, who was fighting with the Houthis, had been killed. "He just got married. That's my last memory of him," says Abdulrahman, as his voice starts to shake. He wipes his eyes and turns away. A short drive from the Markazi Refugee Camp, dozens of male Ethiopian migrants are sheltering from the intense midday sun and the near-constant wind, under trees sparsely scattered across the barren landscape. 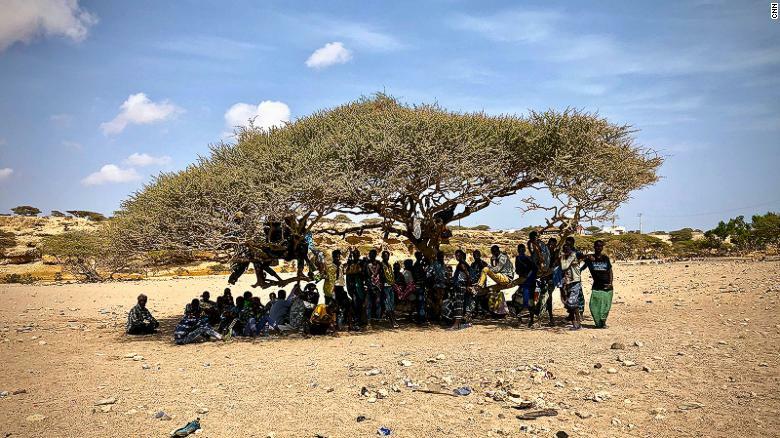 Under the largest tree, one group of men says they have been waiting here for their smuggler for four days, eating only rice. Ethiopian migrants in Djibouti waiting to make the ocean crossing to Yemen, from where they will transit to Saudi Arabia. They say they are unaware there is a war in Yemen. The migrant route from Ethiopia to Saudi Arabia is a well-trodden one. An Ethiopian migrant called Ali says that his relatives made this same journey years ago, before the war. Many of the men have similar stories of relatives who "made it" years ago. But when asked about the war in Yemen, the men shrug. They had been unaware of the dangers ahead. Since 2017, the UNHCR has been running a public awareness campaign about the Yemen war, through music videos and billboards in five languages. But staffers admit that it has yet to make it here to Obock. A group of men wait for smugglers to arrive to take them across the Bab al-Mandeb Strait to Yemen. In Ethiopia, many have access to the internet on their mobile phones -- but in their desperation they chose hope over fear of what lies ahead. "We don't have a choice," says one migrant preparing to cross. "We have to be patient, we have to leave it up to God." Finally, at dusk the Djiboutian smugglers arrive. Using long sticks, they herd the men under the trees into a single file like cattle. 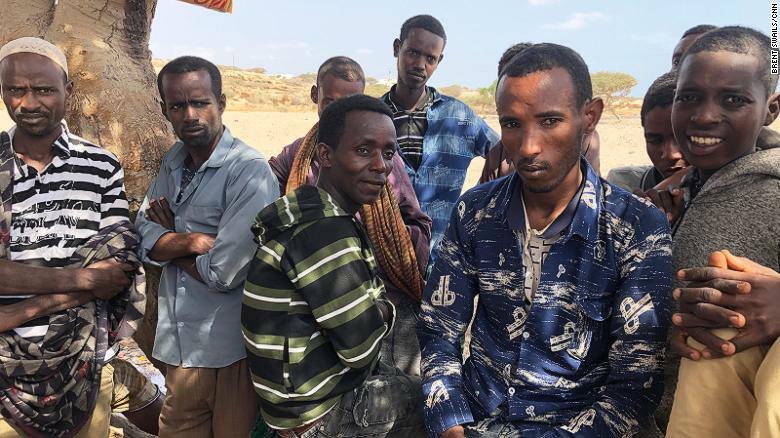 One of the smugglers, his cheek full of khat -- a leaf chewed in the Horn of Africa for its stimulant effect -- says they are moving the group to another location, a crevasse where they will join hundreds of other migrants waiting to make the same journey. Five days later, the IOM reported that two boats carrying migrants capsized off Djibouti's shores. There were 16 survivors, and 30 bodies recovered but a total of 128 were estimated dead. Ethiopian migrants walking to their next destination. Each migrant making this crossing pays a few hundred dollars. That's a fraction of what it can cost to leave Africa via the Mediterranean route -- one reason why Ethiopian migrants by the hundreds still attempt this route each night. The distance is another factor: the majority can walk the thousand or so kilometers from their homes in Ethiopia to Obock, the launching point across the strait and toward the Gulf. They take those first steps, they say, because of an overwhelming feeling of hopelessness at home. Many Ethiopians here say they come from the Oromia region, which is home to an ethnic group historically at odds with the central government, and where more than a million people have been displaced because of political violence. A series of devastating floods and severe droughts -- the worst in decades -- has also pushed the total number of displaced inside Ethiopia up to almost three million people. For the 500 mostly Ethiopians at the IOM transit center in Obock, repatriation is the grim fate awaiting them. "My parents are poor ... (They have) no money. I am the eldest," says Ali. He is just 13. He and the other unaccompanied minors huddle in the same room, opting to sit on the cool floor rather than the foam mattresses lined along the walls. The older men congregate in the courtyard. Ali says he didn't know about the war in Yemen and the five other boys with him say the same. Most Ethiopians who attempt this journey are young men but the IOM transit center does have a women's section, currently home to about a dozen people. Safia, a mother in her 20s, left Ethiopia with a group of her friends. Exhausted and dehydrated when she arrived after walking for days, Safia still has an IV needle in her hand. "I wanted to go to Saudi but when I got here and saw how dangerous it was, I changed my mind. But some of them kept going," she says. Safia doesn't know if her friends made it or not. She has a two-year-old son back home, who she cries for every day.